﻿ Spain - Walking tour on the French Route from Leon to Cebreiro. Spain - Walking tour on the French Route from Leon to Cebreiro. Self-guided walking - Camino Frances from Leon to Cebreiro. 8 days of walking including hotels, meals, luggage transfer, one guide book, maps, English speaking email or phone assistance. El Camino Frances is called the Camino Real, after Leon. The walking path stretches through arid and hilly horizons. Here and there quaint stone villages, their paved streets and their church towers where storks nestle. Then while crossing the Maragatos country, the walk becomes bucolic in a hilly and shady meadows landscape. After the Maragateria (the highest point of the Camino), the way is surrounded by gardens, vineyards and chesnut trees, and leads to a ridge footpath up to El Cebreiro. The Cathedral san Isidoro and San Marcos, the streets around The Plaza Mayor, which is the heart of the lively city. LEON - VILLAR DE MAZARIFE - 21 km – 5h15 walk. VILLAR DE MAZARIFE - HOSPITAL DE ORBIGO - 15 km – 4H00 walk. 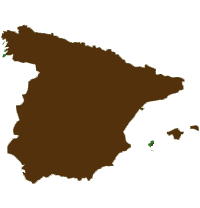 MOLINASECA - CACABELOS – 22 km – 5h30 walk. English Assistance for your reservation and during your trip. 2 and 3 star hotels and Guest Houses . En suite bathrooms. Half board from dinner day 1 to breakfast day 9 (except dinner in Leon). A road book with the description of your program and full detailed walks with a walking map. The trip to the start of the trip and from its end. All lunches. The dinner in Leon.Visits. Drinks. Travel insurance. Everything else that is not listed under "Price includes". CREDIT CARD ONLINE PAYMENT : click on "DATES AND PRICES"
Customize your tour : add or remove one night or more, choose your accommodation, upgrade the hotels,combine with another section of the Way!